We made it through the night ok. I woke JJ at 3:30 a.m. to give him his anti-nausea medication, and I don’t think he slept well after that, but he wasn’t so ill that he woke me up. And shortly after I got up in the morning, he fell asleep for a few hours. A big snow storm is headed our way. The meteorologists have changed the amounts of snow for our area several times. At first it looked like we were only going to get a few inches, but now it looks like we could get a foot or so. The city where the Cancer Center is located could get 20 inches, which might make our trip there on Monday “interesting.” When I was a child, we always got quite a bit of snow like this, but the winters have been mild for the last few years. We also are expecting very cold temperatures. I heard wind chills could get to -30. EJ said he heard they could reach -70. Brrrrr. We spent the morning getting tasks done. JJ was hungry for pizza, so I made homemade pizza for him. I keep searching for the “perfect” pizza dough, and I used a new recipe today. It was very good. My favorite so far. JJ is having a lot of trouble getting pills down these days. He’s also having trouble gargling. Both make him gag. He is supposed to gargle with a cup of warm water, baking soda, and salt to help prevent mouth sores. He felt mouth sores forming so he tried to gargle again late this afternoon, but ended up vomiting. This is the first time he has vomited since Chemo began. It came unexpectedly, so he didn’t make it all in the toilet and it was a bit of a mess. I pulled on my blue medical gloves because JJ’s bodily fluids are toxic, and I cleaned the bathroom really well and did more laundry. Poor boy. JJ has to take his anti-nausea pills while on Chemo and for 48 hours after his last Chemo treatment, so during his “off” weeks he doesn’t take them much. I’m really kicking myself because when I gave JJ his anti-nausea pill this evening, I saw that I don’t have enough left to make it through tomorrow. When I had checked a couple of days ago, I had really thought we had enough to last until next week when we had more time to get to the store, but apparently not. Last time, I had refilled our prescription at the end of his first cycle of intense Chemo, but I learned not to give him a pill before we go to the Cancer Center because the nurses give him the anti-nausea medication in his IV. So, I was only giving him two pills each day rather than three. I think each prescription lasts only about a week. I don’t know why they don’t give us more because we don’t have enough to get through a whole cycle. During our intense week of Chemo, we don’t have time for much of anything. We rush around in the mornings to get to the Cancer Center, then afterwards we have to rush to get home so EJ can get to work. Sometimes we dash into the store and dash out, but after a day of Chemo, JJ just wants to get home so we do as little as we can and rush. This last week we were so tired at the end of each day that we could barely think. I felt panicked about not having enough because the pharmacies were already closed tonight and our regular pharmacy isn’t opened on Sunday. I called another place and learned that they are opened tomorrow. Whew. The problem is that EJ will have to drive ten miles through snow and wind and cold to get there. EJ says, “No problem.” He drives skillfully in snow, but I still worry when he drives in bad weather. I had thought we had everything we needed so we’d all be able to hunker down and not go anywhere tomorrow. So I am really upset with myself. Next time I will get another prescription refilled just before Cycle 3 begins so I will have almost two complete bottles–surely more than enough to get me through. 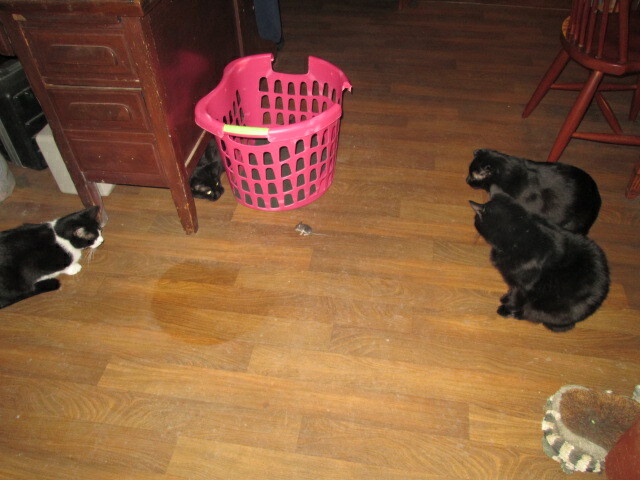 The cats surrounding the mouse, which is in front of the laundry basket. I just pray the roads are too bad for EJ to dash safely through the storm to the pharmacy and home again tomorrow. At this moment, the cats are going after a mouse. We always know when there is a mouse because the cats growl. I wonder, with the weather getting so bad, how many mice will try to find refuge in our house? Hopefully, not many. We already have enough excitement in our lives. Oh, Simone, I am not really awesome, a hero, or an organizer. In reality, I am just trying to muddle through this and care for my family as best I can. Most of the time I feel inadequate because I do not really know what I am doing. We have had mild winters for several years now. Normally I’d be delighted that we again have snow like we did in my childhood. However, with all the traveling we have to do this year, I wish we had another mild winter. I worry about EJ traveling in this weather, even though he reassures me that he has good tires, 4-wheel drive, and lots of skill driving in snow. We had years when we didn’t see a mouse, but in recent years we are getting them more often. I don’t try to rescue them because I don’t want them to climb up me!!!! But, seriously, although they are cute, they breed, get into food, and carry serious diseases. The cats are doing their job when they kill them. Thank you, Simone. Your encouragement puts a smile on my face, and we do take time to laugh as much as we can. We actually have four cats. If you look at the picture, you can see Little Bear under the desk to the left of the basket. The other cats are Kee-Kee, Timmy, and Luke the genius cat. I feel sorry (almost) for mice that get into our house.